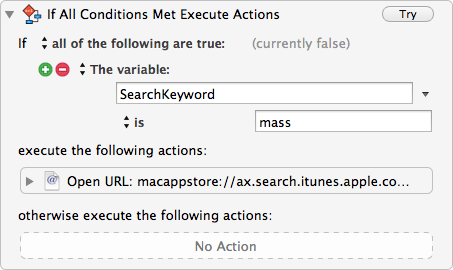 Ever since I first used Alfred, I was most interested in its Web Search capabilities. I was jealous, jealous that Keyboard Maestro didn’t have this function too. But why doesn’t it? Why can’t I just go ahead and make Alfred’s Web Searches in Keyboard Maestro? Well, I can. The macro is nifty, I would say. SearchQuery is pre-filled with your current clipboard. So when you see a neat app on Gabe’s website, you can just highlight its name, ⌥⌴, ↩. The Mac App Store opens and you can directly purchase said app. Just copy & paste a new one, give it a SearchKeyword and make sure to add it to the keyword to Prompt for User Input action, in the SearchKeyword field. WSI also replaces all whitespaces with +. You find more Alfred Web Searches on [Alfred tips](http://alfredtips.com “Alfred tips”). I’m using this macro for a couple of weeks now and find it really useful. Or find it on the Keyboard Maestro Macros repository on GitHub soon.